Keats died today. February 23rd, 1821. He was 25 years old. It is a select group, the band of poets who died young. The admission price is steep. I wish Sophia had not had to pay it. I wish she was not now, like Keats, “forever young.” Yet she is. She will always be 22, as he is 25. “Bury me in garlands/ Of burning paper/ With all my pollen sparks of steel,” Sophie says in one of her poems. Fire and steel. The kid was fierce and she was brave. She was more a Metaphysical than a Romantic poet, but she loved Keats. 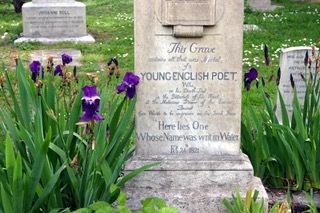 I read his poems at her graveside often. I know she would like that. Still, ripples can reach into far places.